The football defensive end has to protect the ends of the line, stay home, and make sure the offense does not bounce the play to the outside. The player in this position is usually lined up with the offensive or tight end and must have fast feet and strong legs. This position involves getting through the offense to get to the quarterback in order to block or stop a throw. A defensive end also has to be able to make quick reads on passes versus running plays to adjust appropriately. If a running back gets to the outside, past the defensive end, then yards are gained and possible points are scored. Football defensive ends must have great speed, quick hands and feet, and a strong lower body, core, and upper body. The Myosource Kinetic Bands are structured to assist a football lineman in increasing speed and full body strength, while enabling them to warm-up, stretch, and practice at a full range of motion. The resistance bands also allow defensive lineman to train just like they would play, putting tension on the muscles so they work harder and become more explosive. A football defensive tackle needs to be able to stop the run and rush a pass. They must have full body muscle power, flexibility, mobility, endurance, stamina, and leverage or they will not be stable and balanced. Football defensive tackles must have speed to fire off the ball quickly, lower body and core strength to stay low to the ground, and great lateral movements for swim or spin moves. 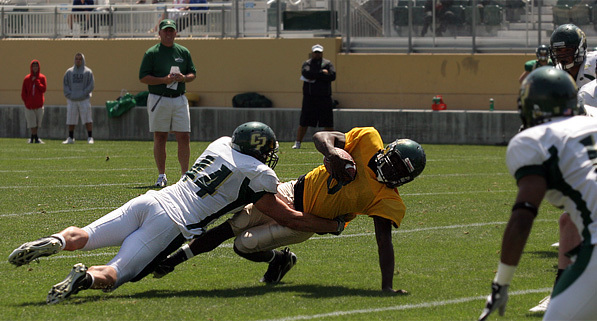 Football defensive linemen must have speed to quickly get off the line as soon as the football is snapped. The idea is to have the edge over anyone who gets in the way of a lineman making a tackle, sack, or block. A football defensive lineman’s stance is very important for getting that first quick step and building momentum to plow through the offense. The three point stance looks like a tripod, where the player bends the upper body in front with the knees bent and one hand out front on the ground for support. A defensive lineman does not want too much of his weight shifted forwards or backwards. The idea is for all the weight to be evenly distributed so that they are fast off the line.